Come to Congressional Briefing and advocate for the continued funding of Medicaid. Congress is looking for ways to save money so it is a critical time to meet with your Members of Congress and tell them not to reduce provider assessment rates. During the May 24th morning Congressional Briefing session, AHCA/NCAL will have a panel discussion on best practices for successfully advocating with elected officials. You'll hear from your peers about what has worked for them and learn specific strategies that you can use in your own advocacy efforts. Reserve your hotel by the April 28th deadline to get the special AHCA/NCAL rate. Don't miss this opportunity to go to Capitol Hill and use your voice to fight for the quality of care that you are able to provide in your centers. The Advance Registration has been extended until Thursday, April 28. 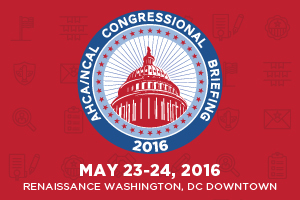 See the complete agenda and register for Congressional Briefing today.